LONDON, July 4, 2010 (AFP) - Rafael Nadal revealed he had to shrug off a bout of nerves before demolishing Tomas Berdych in the Wimbledon men's singles final on Sunday. Nadal looked ice cool as he routed Berdych 6-3, 7-5, 6-4 to claim his second Wimbledon title, but inside the Spaniard's stomach was churning as he tried to deal with the enormity of such a significant occasion. The 24-year-old felt most under pressure at the start of the second set when he allowed Berdych two break points, but he didn't take long to overcome his jitters and deliver another breath-taking display of brutal hitting. "I was a little bit more nervous than usual," he said. "I was a little bit lucky on few moments with the break-points, especially when he missed a backhand into the net. "But if you are not nervous in the final of Wimbledon, you are not human!" With his nerves conquered, Nadal was able to coast to the eighth Grand Slam title of his career in such comfort that there was hardly any drama to excite the capacity crowd on Centre Court. But that mattered little to the world number one, who has now regained the Wimbledon title he won in 2008 and was unable to defend last year due to a serious knee injury. 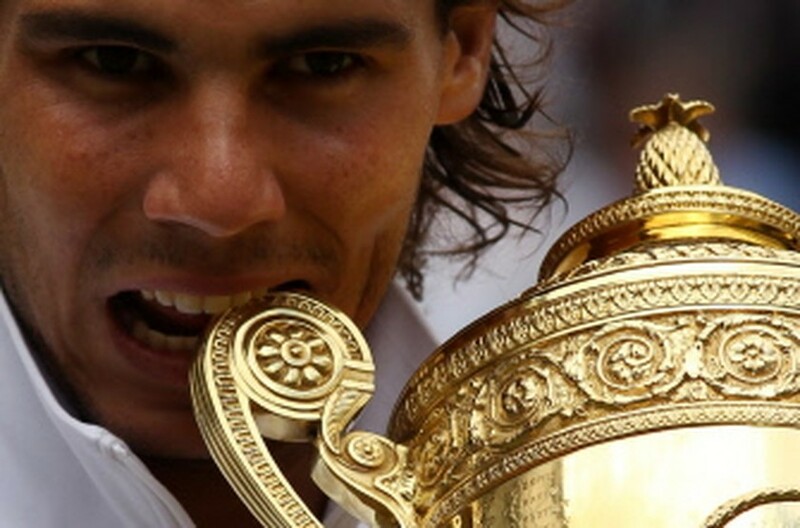 Nadal admitted that first title at the All England Club will always be the most special because of the dramatic nature of his five-set victory over Roger Federer. "It is difficult to say this one is more special. The other one was more dramatic in the way I won. So the first title is always very, very special," he said. "But for sure after a difficult year for me to be back at my favorite tournament and to finish with the trophy is amazing for me. "It was very difficult for me to be back at my best after injury. But I did it, so it is a very important and emotional moment for me." Nadal has now won the French Open and Wimbledon in the same calender year twice - a feat long regarded as the tennis holy grail before Nadal starting to rip up the record books. With just a few weeks between the end of the French Open and the start of Wimbledon, few players had ever been able to adapt to the change from slow clay courts to the faster grass surface in time to win both. Nadal admits it took several years for him to believe it was possible but he insists intensive practice on grass is the only secret to his success. "It didn't happen since Bjorn Borg but now in the last three years it happened twice. How crazy is life?" Nadal said. "For sure it is difficult to play well on grass after winning in Roland Garros. "After a few years I know how important the grass court season is. And after winning in Roland Garros Sunday, I am practising on Monday at Queen's Club because I know how difficult is to change and adapt the surface. "It is difficult but if you have experience and a lot of matches on grass that helps you. "It is important to have the movement on grass and I move well on this court. That's a very important part of the game. "Sure my serve has improved a little bit and it is important to play more aggressive here than on the rest of the surfaces. But the main thing is to really want to improve on every surface." Nadal celebrated his victory over Berdych with a somersault across the hallowed Centre Court turf and he insisted the gesture was purely instinctive. "I didn't think about it. That was my reaction in that moment," he said with a smile.